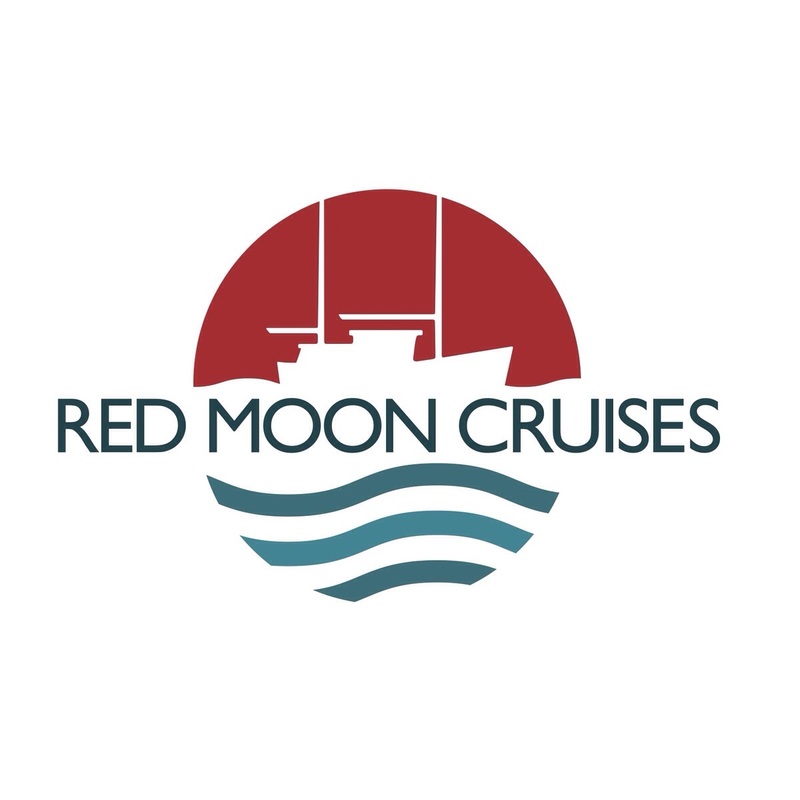 A stunning day in the Clyde but still snow on the hills…it’s been a chilly winter in Greenock but we have stayed snug onboard Red Moon. We are hoping that this might finally be the last of the wintry blasts so that we can get out on deck and get Red Moon ready for the coming season. We are planning to get going after Easter and start our journey north for the summer. We have a good number of bookings but are hoping some warmer weather will get people thinking about what to do this summer…like a Scottish cruise! Our first booking at the moment is out of Kyle in May but we are happy to take enquiries for early spring cruises around the Sound of Mull during our passage up to Skye. In late October and after a very good season based at Kyle Pontoons we sadly said good bye to Skye, Lochalsh and Wester Ross to head south for the winter and the shelter of the River Clyde. It’s fair to say that this Autumn in the UK has been just a teeny bit windy with Storms Ophelia and Brian. It was a bit of a race to get down the Sound of Sleat – we sat out Ophelia in Isleornsay – and around Ardnamurchan Point and into the shelter of Loch Na Droma Buidhe before Brian hit. But we did it and hardly felt a thing! Our return trip took us two weeks this year in part to avoid the storm but also to tie in with one of our ‘Crinan Crew’, Dave, who valiantly drove up from Suffolk to join us and help us through the canal. We did this bit on our own last year – not to be recommended- and we have been very glad to have help both ways. Thanks to Scott’s great planning we avoided most of the nasty seas and in doing so explored some new and known places and enjoyed some downtime before we reached the Clyde. We stopped off in the Holy Loch to see our friends at the Majestic Line, Argyll Cruising and the Holy Loch Marina – well timed to see the Glen Etive piped into her berth alongside the Glens Tarsan and Massan – we ran the Massan about ten years ago! August and September followed a different pattern to our spring and early summer trips as we had a good number of shorter bookings. It was a good chance to see how these cruises worked compared to the longer trips. During August we ran two lunch cruises – both fortuitously on superb sunny days – one down the Kylerhea to Sandaig Bay for a group of four local friends and another to the Kishorn Islands for a mother and daughter who were visiting from the Netherlands. Sandaig Bay was stunning, with views back across to Skye and quite a number of seals to entertain us. 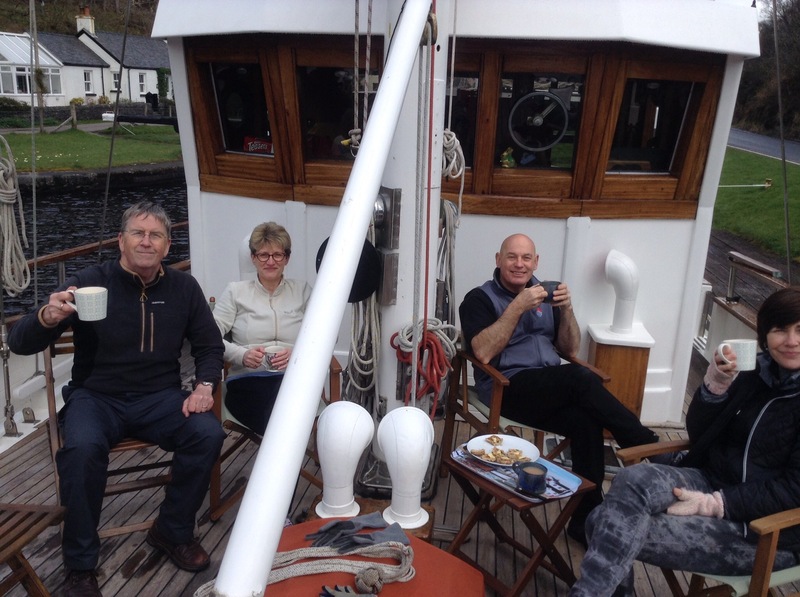 Our guests were able to have a leisurely lunch on the aft deck before we had to head back up Kylerhea. A really lovely day out. On the Kishorn trip it was so still and the water was too inviting for a teenager to not want to jump in! Just as Kira was about to brave it along came a massive jelly fish with very long tentacles… suddenly swimming wasn’t looking so good but with the three adults keeping jellyfish watch around the decks she finally made it in and did a couple of laps of the boat. 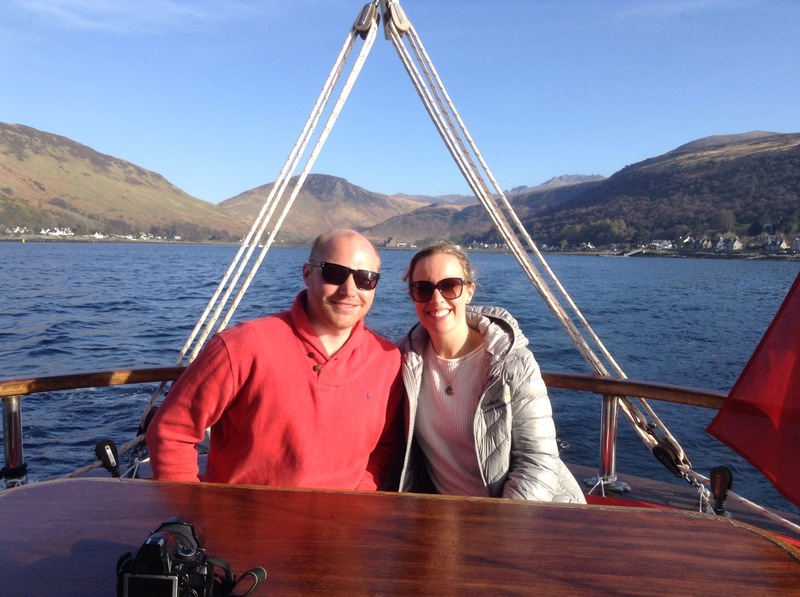 We also did our first ‘ Night at anchor’ cruise for local couple Christine & Kevin who run their own B&B on Skye. It is a curious thing that hosting for people who do a similar thing to us – whether it’s hospitality or professional sailing- can be rather nerve wrecking. Luckily Christine & Kevin were lovely and we had a great evening together. The trip was a birthday surprise so the next day, Kevin’s birthday, he had a fun ( and full!) breakfast onboard opening all his pressies before we slowly made our way from Poll Domhain back to Kyle. For the rest of August we ran a series of two and three night cruises. All of these trips were north of Skye Bridge and included exploration up the Wester Ross and Skye coasts as well as visits to Rona and Raasay islands. We established a kind of triangular route which could vary as to direction and take in a number of different anchorages in between. This month definitely saw a bonanza of wildlife spottings from our now famous Raasay Dolphins ( video on Facebook! ), plenty of seals, pods of porpoises ( mainly close to the Crowlin Islands), sea- eagles off Rona and the Skye coast – and the fabulous otter which was swimming and feeding in Churchton Bay by Raasay. The weather overall was pretty good – not exactly the dog days of summer but good enough to enjoy being on deck to spot the wildlife and do some fabulous exploring ashore. September was a very mixed month for weather with the equinox bringing some strong winds and cooler temperatures. We ran another lunch cruise, this time down to Eilean Donan castle. Red Moon’s cosy wheelhouse and galley- salon came into it’s own as we sailed through a rain shower or two. Luckily it turned sunny as we neared the castle so there was a good photo opportunity moment. As if to make up for the rain a very active pod of porpoises greeted us as we crossed the top of the Kylerhea where the tidal effects can create confused water. Another birthday surprise ‘ Night at anchor ‘ cruise took place this month and this time we cruised down to the Kishorn Islands and anchored there for the night. This is a rather wonderful spot with panoramic views of the Applecross mountains, the harbour at Plockton and views across to the Cuillins on Skye. More obliging porpoises completed the return trip the next morning. Our guests were Rupert & Lin, another local couple who live and work on Skye and it was lovely to talk to them and learn more about life ashore in this wonderful area. In both cases of these special one night trips the “surpriser ” managed to keep their surprises until they walked down to the Pontoons at Kyle and it was great being part of something so special! We had three sets of guests from the United States this month and we loved showing them Skye ‘ from the sea’ as well as the other fabulous parts of this special place – the lochs and coves of Lochalsh and Wester Ross and the islands off Skye. Another local couple joined us early in the month – they also live in Zimbabwe and have taken a number of cruises there, so they were at home on the water – albeit that the scenery and weather this time was very different. They had hoped to visit the Small Isles but wind and sea state did not favour going south from Kyle so, as ever with a plan B, Scott took us north under the Skye Bridge and we headed for Rona. On this trip we decided to make an evening stop at Eilean Fladday. Whilst windy, it was also a stunningly bright day and after a sail down from Rona, complete with sea eagle spotting, we had this interesting and atmospheric anchorage to ourselves. A couple more short trips completed our September activity – another birthday surprise, but this time a short day cruise complete with smoked salmon platter and bubbles and then an evening cruise with local beers and canapés for a film crew who were shooting on Skye. After the lovely Indian summer we had in October 2016 we thought we would stay in Kyle a little longer and in many ways this worked out well as we had another three night booking from a charming Portuguese family who were very taken with Red Moon and just loved the scenery – so different from what they were used to at home. Whilst waiting to leave Kyle we were at anchor one morning in Loch Na Beastie when Scott heard a dog barking ashore. This went on for sometime and so we had a look through the binoculars and could see ‘ a spaniel type dog’ – even at this distance he didn’t look like a working type dog. So being dog fanatics we had to check this out! We took Dougie, our tender, ashore and sure enough – not a spaniel but a gorgeous young red setter. He was shy of us at first but eventually gentle coaxing brought him to us and he was obviously well cared for and we guessed, missing from home. He was very happy to come in the tender and on our way over to Kyle we sent out a Facebook message. It didn’t take long to get some responses and a phone call to the local vet confirmed a red setter had been missing for two days! Within a couple of hours the power of social media brought Paddy’s owners to us and they were overjoyed to be reunited. A very happy finale to our season in Skye and Lochalsh. We didn’t stop long in Oban after our last fabulous cruise and we were on our way up to Ardnamurchan Point en route to Skye when we spotted a water spout. A Minke whale was just astern of us! After a long sail up through the Small Isles we arrived as darkness fell, to anchor in a new place for us – just outside Soay Harbour in the shadow of the dramatic Cuillin Hills. We were back in Skye! We spent the next day exploring Loch Scavaig before heading around into the Sound of Sleat to spend the night at one of our favourite spots at Isleornsay. We waited for the tide to take us up Kylerhea before arriving at our home for the summer on the pontoons at the Kyle of Lochalsh. It was great to be back. After some settling in time we welcomed our first guests on board for a dinner cruise. This was arranged through Frances and David who run ‘thistlesonskye’ – a boutique B&B near Isleornsay and who we met during our first transit of ths Crinan Canal last year. We were fortunate that it was a gorgeous sunny evening and the Waverley – the last sea going paddle steamer in the world – was due to dock at Kyle that very evening. We cruised down to the head of Kylerhea to meet her and while she docked at Kyle, we carried on cruising under the iconic Skye Bridge to another of our regular anchorages in Badicaul Bay where dinner was served and the sunset was admired! 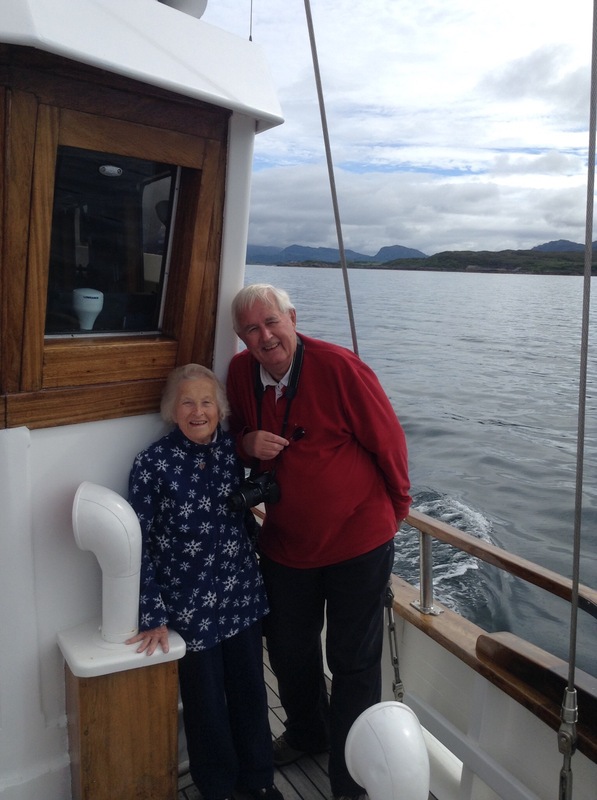 Our first Skye & Lochalsh bespoke cruise guests, Joe and Brenda, joined us for seven nights in early June, arriving by train on the famous Kyle Line from Inverness. With the weather initially favourable, we headed north for Loch Torridon, with a lunch stop at the Crowlin Islands on the way. The afternoon turned somewhat threatening and it became a race to get into Loch Torridon before the rains and wind hit us….. we made it and anchored for the night by the village of Shieldaig where there was time for a short stroll ashore before dinner. We explored Loch Torridon the next morning, spotting an eagle as we cruised through the Torridon narrows. We then headed north to Gairloch with a lunch stop at picturesque Badachro. After an exploration of Gairloch, the evening was spent at another Shieldaig, with a short stroll ashore before dinner. From Gairloch we headed across the Inner Sound, the north of Rona (porpoises sighted here!) and the Sound of Raasay to take in the majestic Trotternish coastline of Skye – The Old Man of Storr and the waterfalls at Lealt. A new lunch stop was Invertote Bay – where we saw ruined buildings from Skye’s industrial past. We crossed back to the lovely anchorage on Rona of Acairseid Mhor, where Joe and Brenda had a walk ashore up to a viewing point where they could look back down onto Red Moon at anchor and out to the Sound beyond. We next headed south down the sheltered east coast of Raasay, spotting a pair of eagles on our way through the Rona channel, down to ‘hole – up’ in Loch Sligachan – the wind by this time was gusting up to force 8! Joe took advantage of a longer stop at anchor to take stimulating walk along the coast of An Aird, the Skye side of the Raasay narrows. With the wind having abated somewhat the next day we motorsailed down into Broadford Bay, where Joe and Brenda were able to explore Skye’s second largest town. We then went to anchor at Caolas Scalpay where we enjoyed the best sunset of the trip. Our final day took us east to Plockton for lunch and a visit ashore. From Plockton we raised both headsails and sailed down to our final nights anchorage at Badicaul Bay. With just a day in between, we welcomed our next lovely guests, Ken and Hazel, who were to join us for an epic 11 day nostalgic re -visit to this corner of western Scotland, where they lived many years ago. The early weather forecast for this trip did not favour our planned itinerary to go north from Kyle, so we made a short trip across Loch Alsh to Loch Na Beastie, a peaceful, green, steep sided loch where we have spotted plenty of seals and on occasion an otter or two. Our first full day took us through the Kylerhea and then a rather lively trip down the Sound of Sleat to Loch Hourn. Whilst transiting the narrows we got a couple of glimpses of an otter feeding along the edge of the fast moving water. We cruised almost to the top of the loch before anchoring for the night in what we hoped was another promising otter spot…..but whilst the otters remained as elusive as ever, we did see a mother and baby deer drinking by the water’s edge and then a mother and baby porpoise swam close around the boat. It was a very magical evening. The next morning after exploring the pool at the very top of Loch Hourn, we made our way out and down to Loch Nevis to stop for lunch near Inverie. We went ashore to explore the venue for the ‘most remote pub on the UK mainland’, popping into a shop selling local venison and crafts. From Inverie we made our way through rather a misty evening to anchor in upper Loch Nevis – a remote but atmospheric spot. On our way we spotted something rather strange on the beach – a whale! It was made of wood and apparently is to be a trans – atlantic ocean going vessel! We happened to see that there was a NZ flag flying on the flagpole on the shore…….that might explain things…. We had hoped to go south from Loch Nevis to visit the Small Isles but sadly the sea conditions dictated otherwise so we headed across the Sound to visit Isleornsay and had a very enjoyable time ashore looking at the oils of William Swann which were displayed in the little gallery there. Hazel and Mary also just had to pop into the lovely shop called Floraid Skye to peruse the gorgeous knitwear and other Scottish made clothing and accessories…! We spent that evening, having come back up Kylerhea, in peaceful Loch Duich where we saw an improvement in the weather. Ken and Hazel enjoyed a fine evening on the aft deck after dinner watching the sunset. Next morning we had a quick provisioning stop at Kyle and then cruised under the Skye Bridge and went north to explore a new anchorage for us, at Poll Domhain on the Applecross coast. This proved to be a lovely spot – we were entertained for hours by the antics of the local seal population. We also explored next door Poll Creadha before heading to the Crowlins for a lunch stop and then finishing up at Caolas Scalpay for a special dinner – Hazel’s niece Andrea and husband Ewan came on board to join us for the evening. After a late start and brunch the next day we headed east, past Plockton and into Loch Carron to start the nostalgia part of the trip. Ken and Hazel lived by the shores of Loch Carron many years ago when Ken was involved with the buidling of the North Sea oil platforms in neigbouring Loch Kishorn. The next morning was a Sunday and there was a visit to their old church and a walk along the village and foreshore before lunch back on board. Next port of call was Loch Kishorn itself which we cruised slowly round so that Ken could relive his time there – although there have been many changes around the Loch since then. We spent that evening in another new peaceful anchorage – Loch Toscaig which is just south of Poll Domhain. The following day we cruised west to Raasay and stopped for lunch in Churchton Bay. This allowed for a short walk ashore before we sailed up to Rona for our night at anchor in this pretty harbour – complete with succesful eagle and otter spotting! From Rona we were able to go north about to Loch Torridon. We had lunch in another great new bay for us – Loch Diabaig – and it was a lovely sunny day too! We spent that evening at Shieldaig after a cruise around Loch Torridon itself and the sun continued to shine. On our way out the next morning we got a fabulous close up view of an eagle in the branches of a tree on Shieldaig island – a really fantastic sighting. After lunch at Poll Creadha we reached our final night anchorage of the trip by the coral beach at Port An Eorna not far from Plockton. Scott, alone, saw yet another otter! A few days later we were joined by freelance writer Martin, who was to be our guest for three days and write about life onboard Red Moon and this fabulous area with a view to an article appearing in one of Archant’s glossy publications! It was quite a busy schedule and started with a night in Loch Na Beastie followed the next day by a packed trip down Kylerhea and the Sound of Sleat, taking in the Sandaig islands, Loch Hourn and an afternoon stop at Isleornsay, before heading back up Kylerhea to stop the night in Loch Duich. The following day we cruised under the Skye Bridge, headed for Raasay where we had a lovely coastal walk, then sailed across to take a peak at Portree and the fabulous coastline north of that town ( complete with another eagle sighting) before heading to our night anchorage on Rona. We had some great weather and a particularly glassy, still evening in Acairseid Mhor. We had a full morning exploring ashore on Rona, visiting Church Cave and the abandoned village of Acairseid Thioram where many of Rona’s population once lived. We crossed back to the Applecross coast to take a look at Poll Domhain, before reaching Plockton where an explore ashore just had to take in a local brew at the Plockton Hotel looking out over the pretty bay! We had an evening cruise back to Kyle for dinner, before Martin’s early departure the next morning. After all that cruising activity we entered a quieter time for bookings but it has been anything but dull! After a short trip back to Devon for Mary to deal with family matters, we decided to go back to one of our new favourite anchorages, Poll Domhain and do some exploring ashore to scope out walks for guests. Returning to the boat via …. we came across the Applecross Photographic gallery. We had a chat with the very helpful lady there, Anne, and the upshot was that the owner and photographer, Jack Marris, came down to talk to us about getting a few shots of Red Moon at anchor. Happily for us all, this turned into a full on photo shoot the next day with Jack taking lots of new interior shots and then climbing hill and glen to get the best views of Red Moon. The climax of all this was a drone video of Red Moon under ( almost) full sail cruising around the fairly small and rocky (!) bay of Poll Creadha! We are looking forward to using many of the pics for our website and in future advertising. Also check out our Facebook page…. Just before we left Kyle to come north we took delivery of a brand new poster to display on the dockside at the pontoons in Kyle – hopefully this will attract the local population and the many visitors who stop at Kyle before haeding across to Skye. Next onboard in early May were our lovely honeymoon couple from Tennesse, who joined us for five nights. Their mission was to arrive at their favourite whisky’s distille ry, Lagavullin on Islay, by boat! But first we fitted in a stop the slate island of Easdale before spending the first night anchored in Jura’s West Loch Tarbert. The following morning we achieved their mission with a rather wild ride down to Lagavullin at the south end of Islay and they went straight ashore for an afternoon of tasting sensations! While we gave the wind a chance to die down we explored Loch Ant-Sailein off Ardbeg and checked out the wildlife…. That evening we headed across to the Sound of Gigha for a night at anchor and the next day sailed up to Tayvallich – where the sun came bursting out just in time for a lunch stop and explore ashore. We spent that night in a very idyllic, peaceful anchorage – at the aptly named Fairy Isles. After a visit to Crinan, we completed their tour of these lovely islands with a sail across the Firth of Lorn with our guests helping to hoist the sails. Our final gorgeous evening was in Loch Spelve where bluebells were still covering the hillsides. With just a day in between we were onto our fourth cruise of the season with another five nighter! Still in Oban we welcomed Kevin, Georgina, Michael and Glynn onboard for what turned out to be one of the most magical weeks we have spent in the Western Islands – the sun shone and the sky and sea were vivid blue all week! This trip was a counterclockwise cruise around Mull. For our first night however, we cruised up to Loch Aline and the group went ashore for a short pre dinner stroll. We then took in colourful Tobermory – with a brief shopping expedition to buy some shorts to make the most of the suunny days! Back across to the mainland and Loch Drumbuie for our second night and then around the north coast of Mull and down to the Treshnish Islands. Perhaps one of the highlights of this trip was time spent on Lunga communing with the colourful and vocal puffins! That night was spent in intimate Gometra harbour, with time to enjoy apperitifs on the ‘poopdeck’. The next day was another classic – across to Staffa and a visit into Fingal’s cave, followed by lunch anchored in the Sound of Iona and an afternoon ashore exploring – and another shopping opportunity! We spent that night in the Sound of Erraid – another idyllic, anchorage complete with white sand beaches. Early 2017 continued cold but mainly dry and we were able to explore a bit more of the area around Greenock with some lovely walks up in the hills, where the very first signs of spring were on their way. Springtime in Greenock saw Red Moon’s crew hard at work sprucing her up for the new season ahead. On a still and gorgeous morning in March we made our way up the Clyde to Clyde Boatyard at Rothesay Dock. We both had a feeling of excitement as this was our first trip out on Red Moon since the chills of winter. We spent a warm and sunny weekend in the boatyard and saw some of the most amazing sunsets we have seen up here! Our first cruise of the season was a surprise birthday trip – the surprise lasted pretty much up to our guest’s arrival at James Watt and Red Moon! We took Nicola and Tom to visit Arran and its lovely distillery, spending the first night in Brodick Bay anchored within sight of Brodick castle. After a visit ashore to Arran Brewery we up – anchored and headed to Lochranza for their Distillery trip.This seemed to go well with them staying on for an extra tasting session and coming back with some samples… We all enjoyed the smooth taste of Arran Gold and a little on-board testing of the 18 year old single malt which can claim another whisky convert in Nicola! This was followed by a night stop at St Ninian’s Bay on Bute; the next day we had a leisurely scenic cruise around the Kyles of Bute, including a walk ashore, with picnic (described by Nicola as a ‘full buffet in a bag’! ), from Kames Bay to Tighnabruich and then onto our final nights anchorage in the Burnt Isles. Following quickly on from this cruise we were joined by Beth, Dave and Allie for our delivery trip up to Oban. We spent the first night in Loch Fyne by Barmore Island and awoke to a gorgeous morning – and Mary’s birthday! It also happened to be Good Friday so after lovely hot cross buns and copious cups of tea and coffee we set forth for our transit of the Crinan Canal. 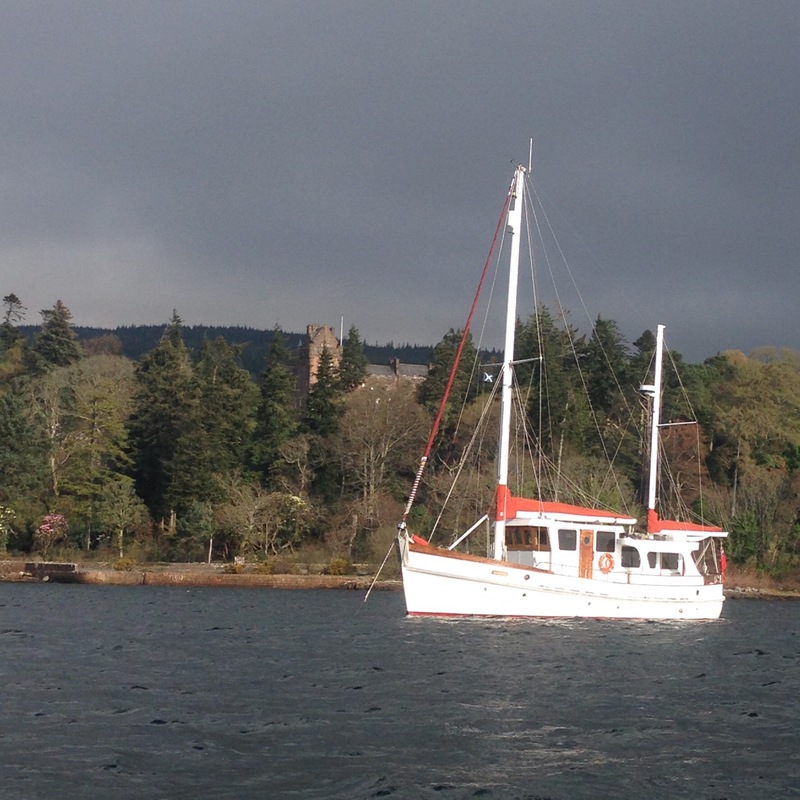 After exiting the canal we went for a little explore in Loch Craignish and spent a windy evening at anchor. The next day we sailed through Dorus – Mor , the Sound of Luing, past the slate island of Easdale before we took a little diversion over the Morvern peninsula where we hoped to catch a glimpse of some sea eagles. Sadly we didn’t see them but there were lots of seals, gannets, shags, the ubiquitous seagulls and more surprisingly rather a lot of noisy Canadian geese! A final fish and chip supper on board followed once we were moored in Oban and then sadly it was time to say good bye….